Ok, here is another command line tool. This time - for developers who create software made of many components. Imagine, you have a product which consists of main executable file and multiple dll files. And different people are working on these. And you are deploying it all on multiple machines and never know where it could be hiding. Maybe in some build directories, maybe somewhere else. So this utility will find all instances of that file and replace with the newest one. Moreover, you can even select the older file, but all files will be replaced by the newest found. Well, there are parameters, of course. As the searching for files is time consuming, the end result of this utility could be a batch file (.bat) which contains commands to repeat operation. It will take the same source file and put it to the same destinations as during the first run. That way, continuous replacing won't be a problem or take more than a couple of seconds. So, here it is. Requires .net framework 3.5. 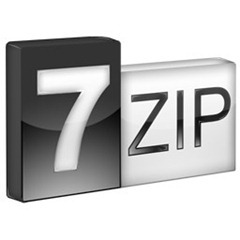 7-Zip is the most effective file archive format, with which far exceeds ZIP and even RAR in terms of compression level. When I realized that a few years ago, and when all tests proved I could store more files without the need of buying new and expensive hard drive, that was kind of relief, as I have a huge repository of files. A few terabytes. You would ask why do I need so much storage, but the fact is – among other trades I am also a trainer, and I need to store my training materials somewhere. And these are mainly not the media files, which are generally well compressed and couldn’t be squeezed further, but documents and images of hard drives and DVDs. Anyway – something that could be compressed. The problem was – all these thousands of files were already compressed by ZIP. The least effective but also the most compatible file format. I own a license for WinRAR, so opening any sort of archive isn’t a problem for me, but I didn’t want to either keep old files in ZIP form when I could compress them up to 10 times better, nor convert ZIP files to 7-ZIP manually. No, I needed to convert ZIP files to 7-ZIP automatically. WinRAR, is quite useful and user-friendly (even though it has one of the worst customer support in software industry), it's compression ratio is not the best, comparing it to less visually attractive free 7-Zip. However, since my precious archives consuming terabytes of data, and hard drives are still quite expensive, especially when you are planning for some redundancy, space becomes more important than graphical user interface of archiver's shell. However, one little freeware thing that comes with WinRAR is called “RAR converter”, or “rarcvt”. It comes in form of command line utility and is able, using WinRAR, decompress other archives, be it ZIP, CAB, ARJ or even ISO and RPM into RAR. I wanted that functionality for 7-ZIP, but it was nowhere to be found. So I had to create it myself. I took Visual Studio and in a few hours made what is called now a 7-ZIP converter. This command line utility was tested on thousands of nested archives and proved to improve the efficiency of data storage from at least 1 and up to 99%. Sometimes there were situations when I couldn’t believe my eyes how it was able to repack the ZIP file to 7-ZIP for the end file to be 100 times smaller than ZIP! I believe that this utility is essential for file server system administrators, as well as for home servers or even personal notebooks, where storage space is quite limited. It does not require installation, but you should have .NET framework 3.5 installed (you already have it in Windows Vista and Windows 7) and, of course, 7-zip. Config file can be edited in Notepad, it has just 3 parameters - the path to 7-zip, path to temporary directory and extensions of archives that should be converted. Utility finds files by file mask, may convert nested archives (that is - when you have one archive inside of another), can delete the original file after conversion and may set the time stamp of original file to the resulting 7-zip archive. Sometimes I re-read my old Twitter posts, in which I just memorize some ideas that comes to my mind, in order to write follow-ups here. Today it is about my First Postulate, which states that once you've stopped learning new stuff - you're dead. So, what do I mean by that and why I am so sure about it? And I am not speaking about IT training here. It's about everything in life. Don't ever stop asking about everything and anything new around you, even if it's not interesting. You may be not watching TV, but you should know that there are LCD, Plasma and LED TVs, that there are receivers for 3D movies etc. There shall be no area in which you are complete zero. Learn about modern styles of music even if you don't understand them. Use one hour per week for reading and try some authors or genres you wouldn't do otherwise. This way, you will help your brain to last longer. To survive. Or even bring yourself to a new level of quality. I mean - the quality of life, as all knowledge has this as a primary target - to improve the quality of life for those, who share the knowledge. I will expand this topic later when will speak about creativity and innovations later on.